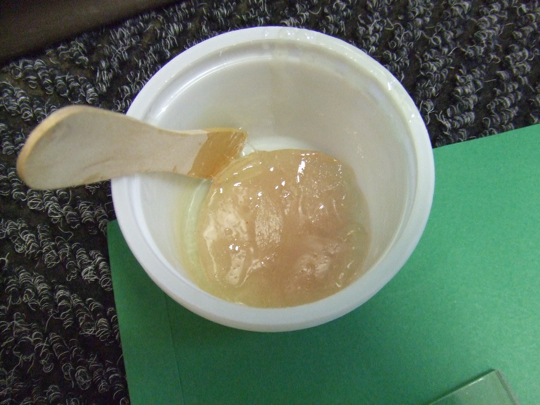 and – it’s really sticky. I learned something about epoxy today. This is the ‘work weekend’ before the school year starts up again, and it’s been very, very productive. We closed on Friday so that we could get things cleaned up, and we had four college students do just a ton of work. As a result, I’m getting to some projects that I’ve put off for a really long time. One of them is our staff ‘welcome’ board in the entryway. I didn’t take a ‘before’ picture but it is basically a frame that is permanently mounted to the wall. 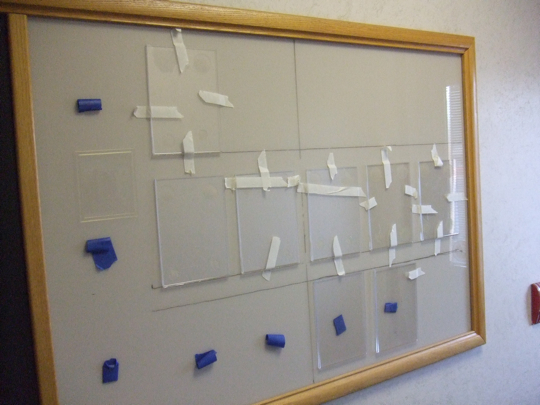 You remove a side of the frame and slide out the plexiglass, then put whatever you want behind it and reassemble the whole thing. I had staff pictures attached to a piece of paper with names and matting, blah blah blah. It looked alright but we have college students who come and go and changing the photos is a thorn in my side. I had an idea. Why not get some of those acrylic frames where you can just slip photos in and out? Genius! After patting myself on the back, I took two weeks to remember to look up a place that would sell those, then another two weeks to order them, then didn’t notice the e-mail from the company that said they didn’t sell the model I ordered, re-ordered them, then they finally arrived. Woo-hoo! Let’s get this party started! I bought some epoxy to glue the acrylic to the acrylic. If you don’t know about epoxy, it comes in two separate tubes and you mix them up to form a mighty super-adhesive. It’s rather dangerous. First I used some little one-shot things that made just enough epoxy for one frame, and I loved them. I didn’t have 18, though, so I had to buy a big tube. I mixed up the whole thing, dabbed it on three frames, hung them up, dabbed three more, hung them up, then went to dab and the epoxy in the cup had solidified and was HOT. Dang. Whew. That was a long boring story, wasn’t it? To make up for it, why don’t you read that last big paragraph again and substitute the word ‘elephant’ for ‘epoxy’. That’ll make up for it. The “getting hot” thing was what surprised me the most about epoxy. I’ve only used it a few times because such serious glue is a little scary. Do I really want things to stick together that permanently? I wonder why, after your post text, it says “You might also like these similar posts: Chives”. What do chives have to do with epoxy? In order to see that text, you have to be looking at just this post, so click the title of the post first. My chives are super-adhesive, too. That looks like a lot of work. I wouldn’t want to do it. It’s kinda fumy, too. On the first evening I couldn’t find my last package of epoxy pods and as I searched and searched the same places over and over I started to wonder if I was high. I’m glad you went to buy the big tube(s) of epoxy. They are much more economical than the single use tubes. I know this because I used epoxy a lot in graduate school and my research advisor made me return all the small tubes because they cost him 70 CENTS EACH!!!!! Apparently I was about to break his entire grant budget. I’ve never used epoxy or seen it used before. Reading this has got me wondering … if you spread a real thin layer on your face in an upward fashion, would it be like having a face lift?? ?